Explanation: Do some surface features on Enceladus roll like a conveyor belt? A leading interpretation of images taken of Saturn's most explosive moon indicate that they do. 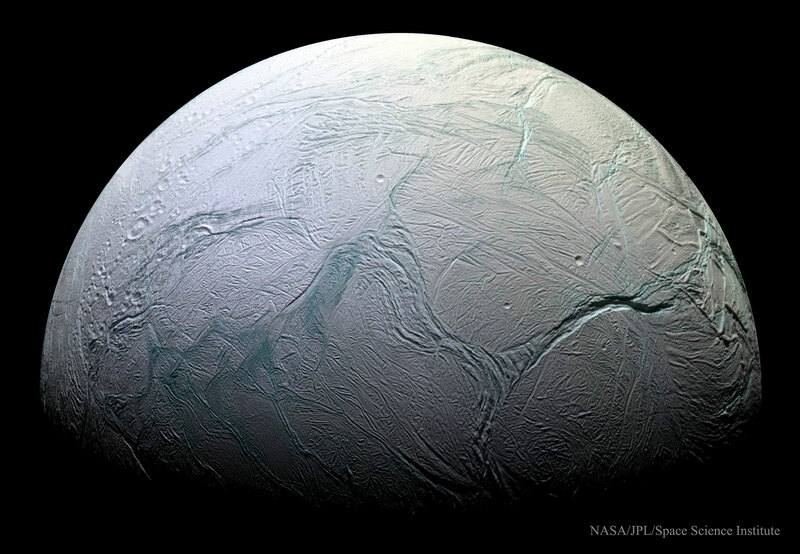 This form of asymmetric tectonic activity, very unusual on Earth, likely holds clues to the internal structure of Enceladus, which may contain subsurface seas where life might be able to develop. Pictured above is a composite of 28 images taken by the robotic Cassini spacecraft in 2008 just after swooping by the ice-spewing orb. Inspection of these images show clear tectonic displacements where large portions of the surface all appear to move all in one direction. On the image right appears one of the most prominent tectonic divides: Labtayt Sulci, a canyon about one kilometer deep. The small magnitude of Enceladus' wobble as it orbits Saturn might indicate damping by a globally extending underground ocean layer.